“Fighting global poverty,” in International Journal of Law in Context, volume 13, special issue 4 (Global Social Indicators: Constructing Transnational Legitimacy), December 2017, pp. 512-526, published online January 3, 2018. “The Enduring Legacy of Western Dominance” in Surendra Munshi, ed. : Democracy under Threat (New Delhi: Oxford University Press 2017), 196–208. “Assessing the sustainable development goals from a human rights perspective,” authored with Mitu Sengupta, in Journal of International and Comparative Social Policy, 32/2 (2016), 83–97, published online July 1, 2016. “The Hunger Games” in Food Ethics, volume 1, issue 1, 9–27; first online June 3, 2016, freely downloadable at http://link.springer.com/article/10.1007/s41055-016-0006-9?view=classic. “World hunger books are cooked,” Guest Editorial, World Nutrition July-August 2015, Volume 6, Number 7-8, 555–557, also available at http://wphna.org/past-issues/. “The Sustainable Development Goals (SDGs) as Drafted: Nice Idea, Poor Execution,” authored with Mitu Sengupta, Washington International Law Journal 24/3 (June 2015), 571–587. “Illicit Financial Outflows as a Drag on Human Rights Realization in Developing Countries” in Global Financial Integrity, ed. : Illicit Financial Flows: The Most Damaging Economic Condition Facing the Developing World (Washington D.C.: Global Financial Integrity 2015), 7–19. “Concluding Remarks” in Hitoshi Nasu and Kim Rubinstein, eds. : Legal Perspectives on Security Institutions (Cambridge: Cambridge University Press 2015), 323–37. “The Sustainable Development Goals: a plan for building a better world?,” authored with Mitu Sengupta, Journal of Global Ethics 11/1 (2015), 56–64, published online March 13, 2015. “The Progressive Potential of Human Rights” in Susanne Kaul and David Kim, eds. : Imagining Human Rights (Berlin: de Gruyter 2015), 35–53. “Are We Violating the Human Rights of the World’s Poor? Responses to Four Critics” in Yale Human Rights and Development Law Journal, 17:1 (2014), 74–87. Here is the original article. “Concluding Remarks: Inequality as a Threat to Allegiance” in Fiona Jenkins, Mark Nolan and Kim Rubenstein, eds. : Allegiance and Identity in a Globalized World (Cambridge: Cambridge University Press 2014), 568–89. “International Law Between Two Futures,” editorial, Journal of International Dispute Settlement, 2014, 5 (3), 432–437, first published online September 15, 2014. “Rethinking the Post-2015 Development Agenda: Eight Ways to End Poverty Now,” authored with Mitu Sengupta, in Global Justice: Theory Practice Rhetoric (7) 2014, 3–11. “‘The Donors’ Dilemma’ – Addressing the Structural Roots of Persistent Underdevelopment,” in Andy Sumner and Tom Kirk, eds. : The Donors’ Dilemma: Emergence, Convergence and the Future of Aid (Durham UK: Global Policy Institute 2014), ch. 16, published online January 22nd, 2014. “Global Tax Justice and Global Justice,” authored with Gillian Brock, in Moral Philosophy and Politics 1/1 (May 2014), Special Issue Global Tax Justice, 1–15. Abstract: With strong resonance across cultures, the word “dignity” has become increasingly prominent in international law and in discussions of global justice. It is used in two distinct but closely related senses. In one sense, dignity is a high worth which all human beings possess as human beings and which commands that they be treated with respect and consideration. 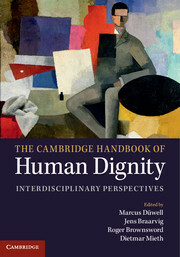 In another sense, dignity is a characteristic of human lives that, for many, remains yet to be achieved. Because human beings have dignity in the first sense, it is imperative to enable them to lead a life in dignity. This paper explicates the two related senses of “dignity” and explores how they can inform and support a conception of global justice and efforts at its realization. “New Millennium Development Goals: A New Version, an Old Wish List,” authored with Mitu Sengupta, in Economic & Political Weekly September 28, 2013 Vol XLVIII No 39, 23–25. “Concluding Reflections,” in Gillian Brock, ed. : Cosmopolitanism versus Non-Cosmopolitanism: Critiques, Defenses, Reconceptualizations (Oxford: Oxford University Press 2013), 294–320. “Universal Agenda on the Multiple Dimensions of Poverty,” authored with Nicole Rippin, background research paper submitted to the High Level Panel on the Post-2015 Development Agenda, May 2013. “Transcending the Washington View of Development,” in Saju Chackalackal, ed. : Towards a Strong Global Economic System: Revealing the Logic of Gratuitousness in the Market Economy (Bangalore: Dharmaram Publications 2013), 73–101. Abstract: Citizens of affluent countries bear a far greater responsibility for world poverty than they typically realise. This is so because poverty is more severe, more widespread and more avoidable than officially acknowledged and also because it is substantially aggravated by supranational institutional arrangements that are designed and imposed by the governments and elites of the more powerful states. It may seem that this analysis of world poverty implies that citizens of affluent countries have forfeited their right not to be killed in the course of a redistributive war and that such a war would be both just and permissible. In fact, however, it has none of these three implications. This finding should be welcomed insofar as violence and macho talk of violence are in our world highly counterproductive responses to the injustice of poverty. “Cosmopolitanism: a Path to Peace and Justice” in Journal of East-West Thought, No. 4, Vol. 2, December 2012, 9–32. “Concluding Remarks: Discourse versus Strategy” in Brad Jessup and Kim Rubenstein: Environmental Discourses in Public and International Law (Cambridge: Cambridge University Press 2012), 436–447. “Poverty, Human Rights and the Global Order: Framing the Post-2015 Agenda,” Social Science Research Network, April 26, 2012. “Divided against Itself: Aspiration and Reality of International Law” in James Crawford and Martti Koskenniemi, eds. : The Cambridge Companion to International Law (Cambridge: Cambridge University Press 2012), 373–397. “Nanoscience, ethics and progress: The poor and advanced technologies,” authored with Layne Hartsell and John Weckert, 2011 International Conference on Nanoscience, Technology and Societal Implications (NSTSI), December 2011. Abstract: A human rights violation involves unfulfilled human rights and a specific active causal relation of human agents to such non-fulfillment. This causal relation may be interactional; but it may also be institutional, as when agents collaborate in designing and imposing institutional arrangements that foreseeably and avoidably cause human rights to be unfulfilled. Readily available evidence suggests that (a) basic social and economic human rights remain unfulfilled for around half the world’s population and (b) the design of supranational institutional arrangement plays a major role in explaining why the poorer half of humanity is suffering a rapid decline in its share (now below three percent) of global household income. A strong case can be made, then, that people like myself – well-to-do citizens of influential states – collaboratively violate the human rights of the global poor on a massive scale. That most of us find this conclusion obviously mistaken does not discredit it because they have not investigated the institutional causes of the non-fulfillment of human rights nor relevant institutional reform possibilities. “Allowing the Poor to Share the Earth” in Journal of Moral Philosophy 8/3 (2011), 335–352. Abstract: Two of the greatest challenges facing humanity are environmental degradation and the persistence of poverty. Both can be met by instituting a Global Resources Dividend (GRD) that would slow pollution and natural-resource depletion while raising funds for averting poverty worldwide. Unlike Hillel Steiner’s Global Fund, which is presented as a fully just regime governing the use of planetary resources, the GRD is meant as merely a modest but realistic step toward justice. Paula Casal has set forth various ways in which this step might be improved upon. Solid counter-arguments can be given to her criticisms and suggestions. But to specify the best (effective and realizable) design of an appropriate global institutional mechanism with some confidence, economists, political scientists, jurists, environmental scientists, and activists would need to be drawn in to help think through the immense empirical and political complexities posed by the urgent task. “Unfair Share” in RSA Journal (Spring 2011), 10–13; reprinted in Making It, Issue 7: Governing a globalized world” August 2011, 30–33. “Human Rights and Global Wrongs” in Reflections — A Magazine of Theological and Ethical Inquiry (Fall 2010), 44–46. “Keynote Address: Poverty, Climate Change, and Overpopulation” in Georgia Journal of International and Comparative Law 38 (2010), 525–542. Abstract: The estimates of the extent, distribution and trend of global income poverty provided in the World Bank’s World Development Reports for 1990 and 2000/01 are neither meaningful nor reliable. The Bank uses an arbitrary international poverty line unrelated to any clear conception of what poverty is. It employs a misleading and inaccurate measure of purchasing power “equivalence” that vitiates international and intertemporal comparisons of income poverty. It extrapolates incorrectly from limited data and thereby creates an appearance of precision that masks the high probable error of its estimates. The systematic distortion introduced by these three flaws likely leads to a large understatement of the extent of global income poverty and to an incorrect inference that it has declined. A new methodology of global poverty assessment is feasible and necessary. “How Many Poor People Should There Be? A Rejoinder to Ravallion” in Sudhir Anand, Paul Segal and Joseph Stiglitz, eds. 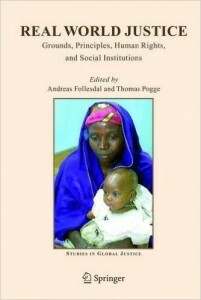 : Debates on the Measurement of Global Poverty (Oxford: Oxford University Press 2010), 102–114. “The Role of International Law in Reproducing Massive Poverty” in Samantha Besson and John Tasioulas, eds. : The Philosophy of International Law (Oxford: Oxford University Press 2010), 417–435. “World Poverty” in John Skorupski, ed. 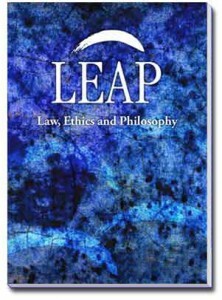 : Routledge Companion to Ethics (London: Routledge 2010), 796–807. “Baselines for Determining Harm” in Joel Rosenthal and Christian Barry, eds. : Ethics and International Affairs (Washington DC: Georgetown University Press 2009), 329–34. “Poverty” in Berkshire Encyclopedia of Sustainability (Vol. 1): The Spirit of Sustainability (Great Barrington MA: Berkshire Publishing Group 2009), 317–320. “Concluding Remarks” in Jeremy Farrall and Kim Rubenstein, eds. : Sanctions, Accountability, and Governance in a Globalised World (Cambridge: Cambridge University Press 2009), 407–417. “How World Poverty is Measured and Tracked” in Rights and Development Bulletin 1/10 (2008), 5–13; reprinted in Absolute Poverty and Global Justice as chapter 3. Abstract: In 2015, the world will celebrate the achievement of the first Millennium Development Goal (MDG-1): to halve world poverty by 2015. But this foreseeable achievement crucially depends on how poverty is being measured and tracked. It depends on choosing an extremely low international poverty line: people are counted as poor only if the cost in local currency of their entire annual consumption has less purchasing power than $456 had in the US in 2005. By setting the international poverty line at twice this level, one would turn a 23% decline in the number of poor during 1990–2005 into a 2% increase. The achievement of MDG-1 also crucially depends on two reinterpretations of what it means to halve poverty by 2015. After promising to halve the number of poor people, then the proportion of poor in world population, the world’s governments have now settled on halving the proportion of poor among the (faster-growing) population of the developing countries. They have also back-dated the beginning of the MDG period to 1990 (with the result that MDG-1 was fully achieved in the world’s most populous region one full year before this goal had even been adopted!). These two revisions raise the number of those whose extreme poverty in 2015 will be deemed morally acceptable from 836 million to 1327 million — and they ensure that a 21% reduction in the number of poor during 2000–2015 suffices for success. 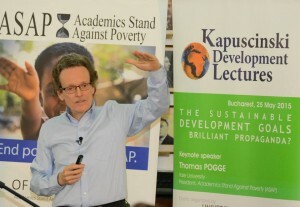 The achievement of MDG-1 will owe much more to the clever shifting of goalposts than to reductions in world poverty. “Introduction to the Two-Volume Collection” in Thomas Pogge and Keith Horton, eds. 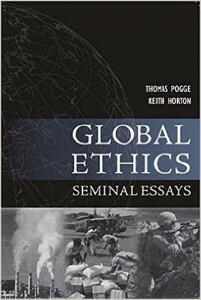 : Global Ethics: Seminal Essays (St. Paul, MN: Paragon House 2008), xiii-xxiv, and in Thomas Pogge and Darrel Moellendorf, eds. 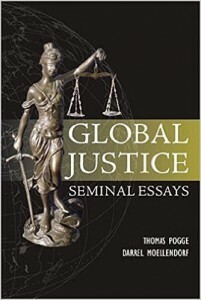 : Global Justice: Seminal Essays (St. Paul, MN: Paragon House 2008), xiii-xxiv. “Reframing Global Economic Security and Justice” in David Held and Anthony McGrew, eds. : Globalization Theory: Approaches and Controversies (Cambridge: Polity Press 2007), 207–224. Abstract: For a world in which the resources of INGOs fall short dramatically of the needs they seek to meet, I propose and critically discuss a principle for setting priorities: Other things being equal, an INGO should govern its decision making about candidate projects by such rules and procedures as are expected to maximize its long-run cost effectiveness, defined as the expected aggregate moral value of the projects it undertakes divided by the expected aggregate cost of these projects. Here aggregate moral value, or harm protection, is the sum of the moral values of the harm reductions (and increases) these projects bring about for the individual persons they affect. “Respect and Disagreement: A Response to Joseph Carens” in Daniel A. Bell and Jean-Marc Coicaud, eds. : Ethics in Action: The Ethical Challenges of International Human Rights Nongovernmental Organizations (Tokyo: United Nations University Press, and Cambridge: Cambridge University Press 2007), 273–278. Abstract: A critique of the proposal by Kofi Annan and Thomas Franck for relaxing the UN Charter constraints on humanitarian intervention. Abstract: Various human rights are widely recognized in codified and customary international law. These human rights promise all human beings protection against specific severe harms that might be inflicted on them domestically or by foreigners. Yet, international law also establishes and maintains institutional structures that greatly contribute to these human rights not being fulfilled: Fundamental components of international law systematically obstruct the aspirations of poor populations for democratic self-government, civil rights, and minimal economic sufficiency. And central international organizations, like the WTO, IMF, and World Bank, are designed so that they systematically contribute to the persistence of severe poverty. On the most plausible construal of the duties that human rights impose, those contributing to the design or imposition of such institutional structures are violating the human rights of the global poor. “World Poverty and Human Rights” in Ethics and International Affairs 19/1 (2005), 1–7; reprinted in Judith Boss, ed. : Analyzing Moral Issues, 4th edition, (Columbus OH: McGraw-Hill 2007); reprinted in Joel Rosenthal and Christian Barry, eds. : Ethics and International Affairs (Washington DC: Georgetown University Press 2009), 307–15; reprinted with revisions in Matt Zwolinski, ed. : Arguing about Political Philosophy (New York: Routledge 2009), 558–564; reprinted in Steven Cahn and Robert Talisse, eds. : Political Philosophy in the Twenty-First Century (Boulder: Westview Press 2012), 253–260. Abstract: Introducing the symposium on my book (of the same title), I sketch its three main (parallel) lines of argument: The present radical inequality of life chances is unjust in virtue of its actual history, in virtue of depriving the global poor of a fair share in the benefits from the use of planetary resources, and in virtue of its being sustained by a global institutional order that foreseeably produces avoidable massive human rights deficits. All three arguments reach the conclusion that, by defending the present radically unequal distribution, the affluent countries and their citizens are harming the global poor. This conclusion differs from the usual presentations of world poverty according to which its causes are local and our duties in regard to it are positive ones of charity, aid, and assistance. “Severe Poverty as a Violation of Negative Duties” in Ethics and International Affairs 19/1 (2005), 55–83. Abstract: Responding to five critics, I address the objections each of them has made. Against Mathias Risse, I show that economic progress over the last two centuries cannot support his view that the present global order is imperfectly developed rather than unjust and that its coercive imposition is not a harm done to the global poor. Against Alan Patten, I show that my view escapes the dilemma he poses by invoking more than a minimalist procedural conception of justice and yet less than a maximalist substantive one that would involve me in stretching the meaning of “harm” beyond recognition. In response to Rowan Cruft, I clarify that I do not mean to deny (or assert) that human rights entail positive duties, that I focus however on human-rights-imposed negative duties, and that such negative duties may trigger positive obligations (e.g., to help reform unjust social institutions and to protect their victims). Against Norbert Anwander, I defend my claim that there is a negative duty not to take advantage of injustice which is distinct from, and not reducible to, the negative duty not to contribute to injustice. And in response to Debra Satz I correct some common misunderstandings and then elaborate who should count as a participant in the design or imposition of unjust social institutions and what such individuals should reasonably demand of themselves. Abstract: We citizens of the affluent countries tend to discuss our obligations toward the distant needy in terms of donations and transfers, assistance and redistribution: “How much of our wealth, if any, should we give away to the hungry abroad?” This way of conceiving the problem is a serious moral error, and a very costly one for the global poor. It depends on the false belief — widespread in the rich countries — that the causes of the persistence of severe poverty are wholly indigenous to the countries in which it occurs. There are indeed national and local factors that contribute to persistent poverty in developing countries. But global institutional rules also play an important role in its reproduction, in part by sustaining the national and local factors that affluent Westerners most like to blame for the problem. Since these rules are shaped by our governments, in our name, we bear moral responsibility not merely by assisting the distant poor too little, but also, and more significantly, by harming them too much. Abstract: The increasingly widespread expression “global justice” marks an important shift in the structure of our moral discourse. Traditionally, international relations were seen as sharply distinct from the domain of domestic justice. The former focused on interactions among states, while the latter evaluated the design of a national institutional order in light of its effects on its individual participants. Such institutional moral analysis is and should now be applied to supranational institutional arrangements which are becoming ever more pervasive and important for the life prospects of individuals. The traditional lens presents fair agreements among (internally just or unjust) sovereign states. The new lens shows a deeply unjust global institutional order that enriches elites in both rich and poor countries while perpetuating the oppression and impoverishment of a majority of the human population. “Cosmopolitanism: A Defence” (with David Miller) in Critical Review of International Social and Political Philosophy 5:3 (Autumn 2003), 86–91. Abstract: Large segments of humankind are so poor that their social and economic and often their civil and political human rights remain unfulfilled. Who bears what responsibilities toward solving this problem? A recently proposed ‘Universal Declaration of Human Responsibilities’ provides no answers. Against competing interpretations of the responsibilities entailed by the ‘Universal Declaration of Human Rights’, §28 of this Declaration suggests that human rights give those subjected to an institutional order moral claims against those who impose it. This suggestion implies, plausibly, that the more powerful states imposing the international order must shape it so that (insofar as is reasonably possible) all persons subjected to it have secure access to the objects of their human rights. If those states lived up to this responsibility, much of the current vast underfulfillment of human rights would be avoided. “Economic Justice, National and Global” (Chinese) in Dushu 2002:1, and in Taishe 44; English text in Nicholas Bunnin, Qiu Renzong and Jiang Yi, eds. : Political Philosophy (Beijing: China Social Sciences Press 2010). “Preempting Humanitarian Interventions” in Ian Carter and Mario Ricciardi, eds. : Freedom, Power and Political Morality: Essays for Felix Oppenheim (London: Palgrave 2001), 153–170; reprinted in Aleksandar Jokic, ed. : Humanitarian Intervention: Moral and Philosophical Issues (Peterborough: Broadview Press 2003), 93–108. Abstract: This essay discusses four kinds of strategies for reducing the occasions on which humanitarian interventions look imperative and highlights particular reforms of our global order that would make it more encouraging of good government. Abstract: One third of all human deaths are due to poverty-related causes, to malnutrition and to diseases that can be prevented or cured cheaply. Yet, our politicians, academics, and mass media show little concern for how such poverty might be reduced. They are more interested in possible military interventions to stop human rights violations in developing countries, even though such interventions produce smaller benefits (if any) at greater cost. This Western priority may be rooted in self-interest. But it engenders, and is sustained by, a deeply flawed moral presentation of global economic cooperation. The new global economic order imposed by the wealthy and powerful states aggravates global inequality and reproduces severe poverty on a massive scale. On any plausible understanding of our moral values, the eradication of such poverty is our foremost responsibility. Abstract: This essay argues that political efforts toward eradicating poverty in the developing countries should take precedence over political efforts to get more poor and oppressed persons admitted into our affluent societies. Efforts of both kinds are directed at morally worthy goals. But the former efforts are likely to be far more effective than the latter. “Liberalism and Global Justice: Hoffmann and Nardin on Morality in International Affairs” in Philosophy and Public Affairs 15/1 (Winter 1986), 67–81. Abstract: The essay argues for a conception of global justice that (a) is “liberal” in orientation and (b) focuses on “social institutions” (not on conduct and policies within some prevailing global regime). The two parts of my thesis are explained and defended against the background of two recent books. Terry Nardin’s Law, Morality and the Relations of States comes into conflict with the moral commitments of liberalism, while Stanley Hoffmann’s Duties Beyond Borders attacks the Rawlsian emphasis on social institutions. 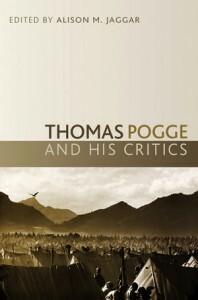 Pogge and Moellendorf have performed a great service by thoughtfully selecting a set of fundamental philosophical essays, written by distinguished moral and political theorists, and all addressed to the largest moral issues of our time: human rights, national and cosmopolitan identities, destitution, war, and the prospects of a more decent world. 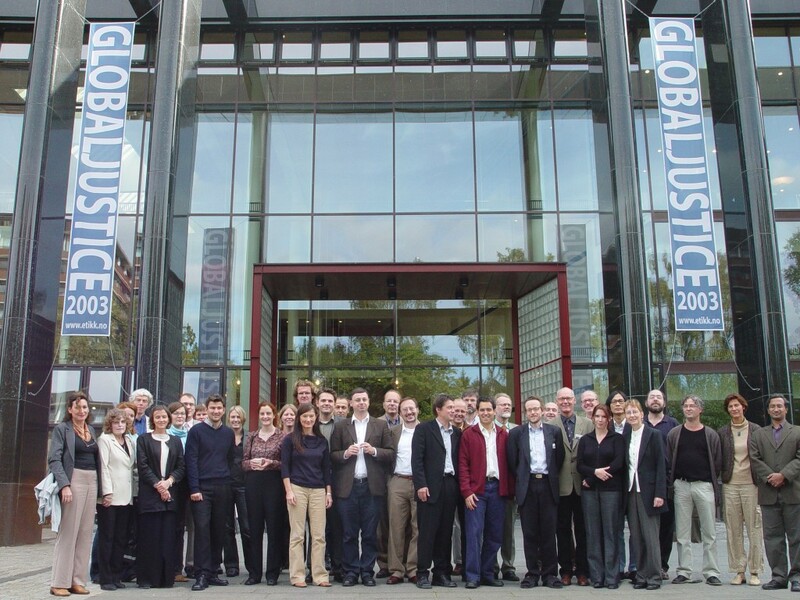 If you want to understand global justice—and you should—this is the place to start. Not only have Moellendorf and Pogge managed to gather all the seminal essays on global justice published in the last thirty years; equally importantly, their introduction sets out, clearly and lucidly, the terms—past, present and future, of this debate. 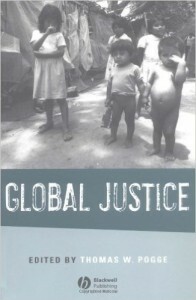 This collection of essays on global justice will undoubtedly become an essential teaching and researching tool. If the contributors to these two volumes help us to understand that poverty, which arguably poses the gravest threat to human life and dignity today, is the product of a deeply inequitious global order, they also enable us to think through what our moral entitlements and duties in relation to these unjust global arrangements are. These landmark volumes will be read, re-read, appreciated, and engaged with for times to come. "Covering countless moral and current issues that are the questions of our time such as human rights, national identity, war, and the betterment of mankind as a whole....deftly assembled and has the highest recommendation..."
What Is So Special about Our Fellow Countrymen? Democracy: From City-States to a Cosmopolitan Order?